As October comes to an end, I’ve noticed there are a lot of houses in my neighborhood with outdoor decorations and pumpkins on porches. My mom said at the end of October every year, many people celebrate by dressing up in costumes and going door to door saying “Trick or Treat!” She also said that this is a time of year when children get a lot of candy! Now, I’m not certain about every dog and cat’s house rules, but I’m not allowed to eat candy and having a lot of it around can be very tempting. It can also be very dangerous to my health if I eat any of it because what may taste yummy to humans, isn’t always the best for me. Knowing this house rule got me thinking about other rules that are out there when it comes to Halloween safety. I found that there are a lot of important tips for my mom to follow in order to make sure I stay safe. 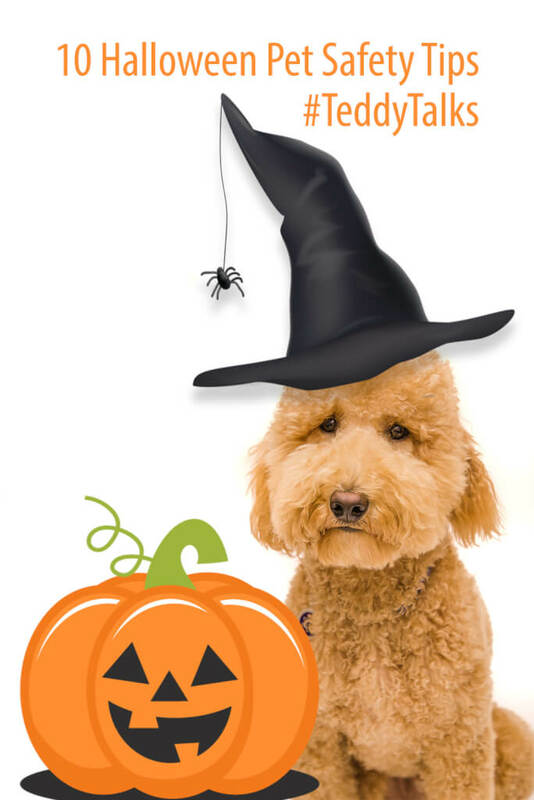 Here is an article I found helpful when it comes to pet safety on Halloween night. Click here to read it. You’ll see in the article that it is important to only dress your pet in a costume if they’re comfortable and to test out their costume beforehand. I think this is really important. I wear a collar, bandana, and a vest every day to work and I tried it on before to make sure it wasn’t too constraining and didn’t itch. It isn’t fun wearing something for long periods of time if it isn’t comfortable on my fur. Since I am comfortable in my costume, I’ll be posting to my Instagram account on Halloween. If you’d like, you can follow me @TeddyBaue or by searching for #TeddyBaue. I hope all of my fur friends have a fun evening and most importantly stay safe!